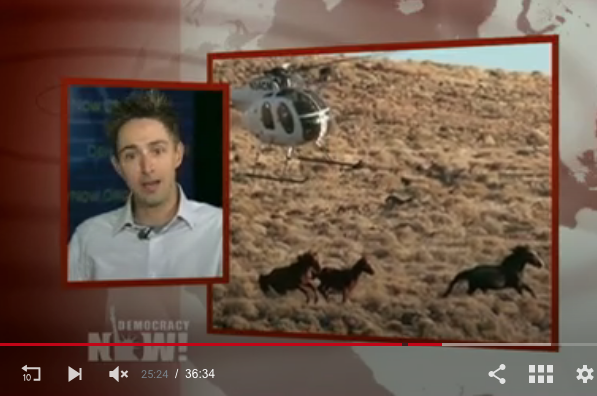 Wild Horse Eduction members assist media members with multiple stories each year. Media coverage is a great way to reach a large audience. Extended piece in the Daily Beast on the work of Wild Horse Education and some of the challenges we face by Christopher Ketcham. (adult article) Click below o go to the Daily Beast. Profile piece on our founder in the Review-Journal by John Glionna. Click link below to go to the Review-Journal Article. Democracy Now! segment featuring Amy Goodman's interview with Dave Philipps. The investigation into BLM selling wild horses to Tom Davis, a family friend of former Secretary of Interior, Ken Salazar. Our work has been featured in the books such as: "Born Wild, Soul of A Horse" by author Joe Camp (Benji books), "Wild Horse Country" by author Dave Philipps. Our work has appeared in multiple law journals and reference guides including "The Law of Journalism and Media;" Trager, Ross and Reynolds. The above represents a fraction of the media coverage since our work began and are presented in random order.